Family Tree DNA is the oldest DNA testing company—and it shows, for the wrong reasons. Its website and results appear outdated compared to newer, sleeker services like 23andMe and AncestryDNA. That said, Family Tree DNA has some intriguing features you won’t find elsewhere. It takes a collaborative approach by letting you share your genealogical and genetic info with a project, where you can help uncover the shared lineage of families. It can also test up to three different parts of your DNA, depending on which versions of the test you pay for. 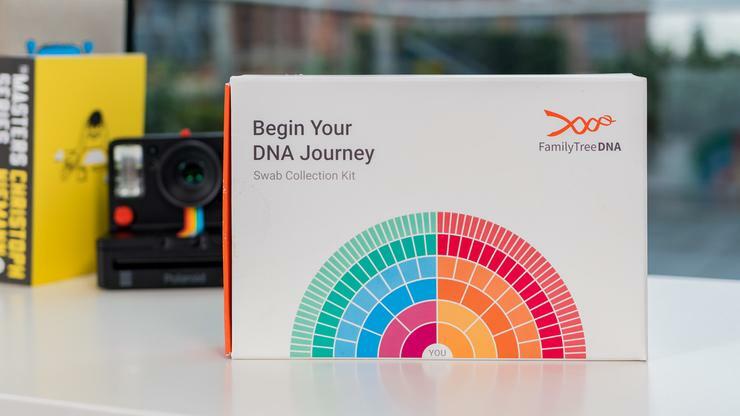 Here’s what’s in Family Tree DNA’s kit. Like 23andMe and Living DNA, Family Tree DNA can also test your mtDNA and yDNA (if you’re male). mtDNA comes from your mother while yDNA comes from your father. These types of DNA can reveal your ancient forebearers on either your mother’s or father’s side, known as a haplogroup. With this information, the test can show you the supposed ancient migration patterns of your ancestors. But Family Tree DNA disappoints with confusing pricing that requires you to pay extra to get more results about your DNA. 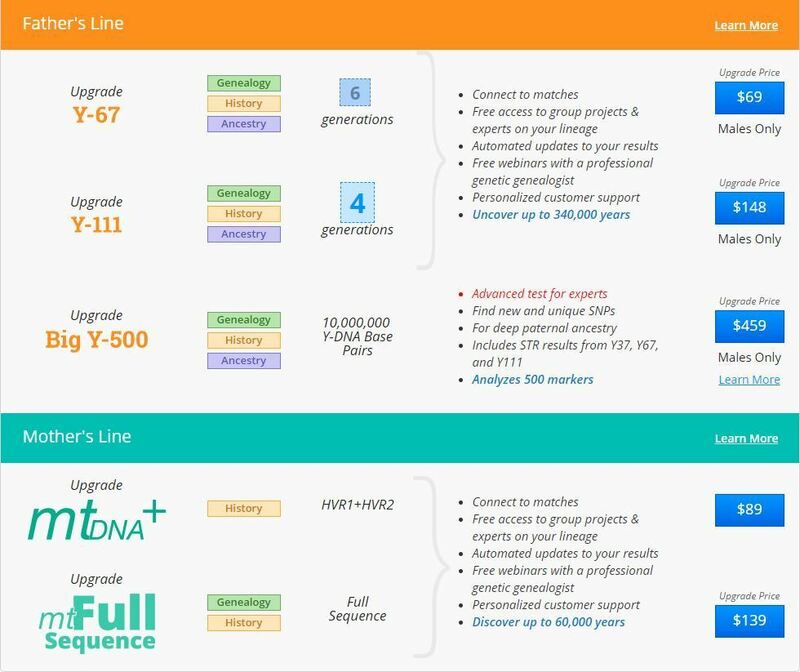 The service charges separately to test your autosomes ($79), yDNA ($169), and mtDNA ($199). So it sets you back a whopping $447 to get everything tested. 23andMe and Living DNA, on the other hand, test all these three parts of your DNA for just $99. Of course, Family Tree DNA isn’t the only one to charge separately: Helix also nickels-and-dimes you with “upgrades” after you take your test. To justify the costs, Family Tree DNA argues that its test more closely examines your DNA than its competitors. While other tests typically identify mutations to estimate an individual’s ethnicity, Family Tree DNA compares up to 500 STR (short tandem repeat) markers, which are specific segments of DNA that people share, and thousands of SNP (single-nucleotide polymorphisms), known as “snips” of DNA, that can distinguish a specific population. Because it provides a low-level analysis, Family Tree DNA is the only major DNA test that can specifically identify whether a relative is from your mother’s or father’s side. This feature alone makes Family Tree DNA a test to consider. The company just redesigned its packaging and provided PCWorld with a demo kit. Much like MyHeritage DNA, Family Tree DNA’s kit now includes two mouth swabs that you break into vials of DNA preservation fluid. Before, it provided no preservation fluid for the swabs. 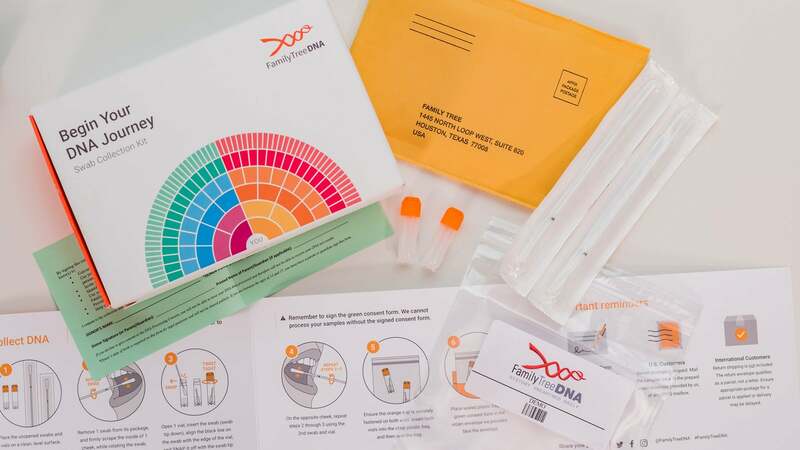 Unlike other tests, Family Tree DNA doesn’t require you to register your kit online. Instead, you’re given login information in the email confirmation of your order. Make sure the kit’s number matches the one you got in the email. Since Family Tree DNA offers different types of tests, the time it takes to get results can vary. The basic Family Finder test for your ethnicity and DNA matches takes 4 to 6 weeks, while the other tests are 6 to 8 weeks. That makes Family Tree DNA more or less comparable to MyHeritage DNA, which also takes 4 to 6 weeks for the same kind of results, while AncestryDNA and 23andMe take 6 to 8 weeks. Family Tree’s online dashboard isn’t streamlined and is sometimes disorienting. There are just so many tabs under each test you purchased. Each tab opens up a page where you can learn another piece of your DNA story. It doesn’t offer any guidance about where and how you should begin. I’d prefer a vertical layout that guides you through your results like 23andMe’s and Living DNA’s approach. But my biggest problem with Family Tree is that the ethnicity results, found under the myOrigins tab, were way off. Family Tree identified me as 78 percent British, 20 percent Eastern European, and 2 percent Scandinavian. 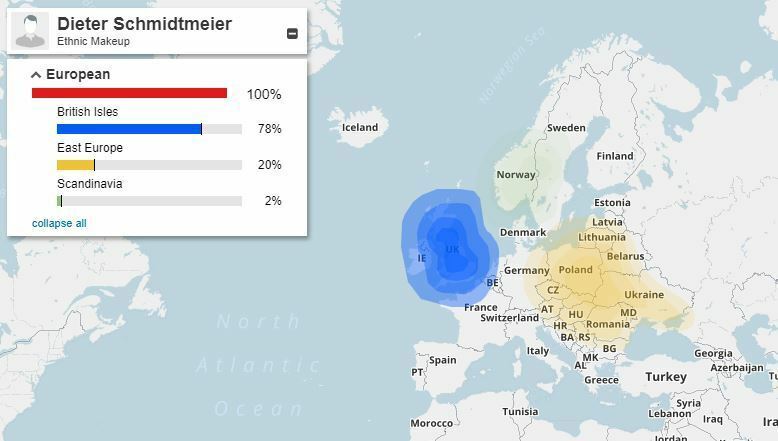 Considering my father emigrated from Germany and both sides of his family were natives with some Swedish lineage, these results were very, very off. My mother’s side has some British and (suspected) Eastern European ancestry, but nowhere near enough to constitute 78 percent of my ethnicity as British. 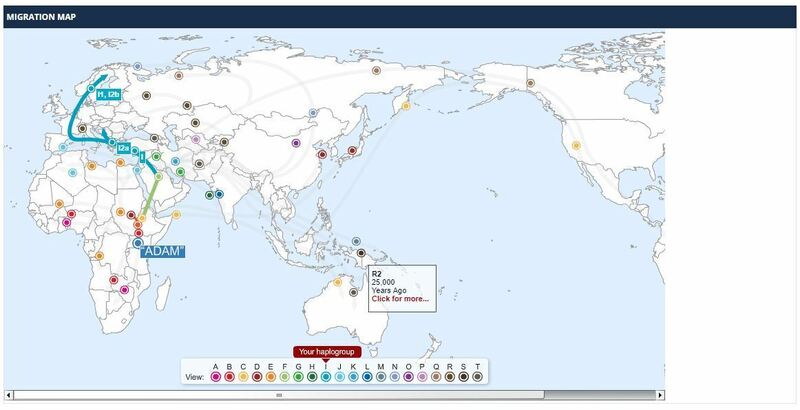 Family Tree DNA’s myOrigins map is typical of what you find from other DNA tests. Unfortunately, this feature is only available to people of European descent. 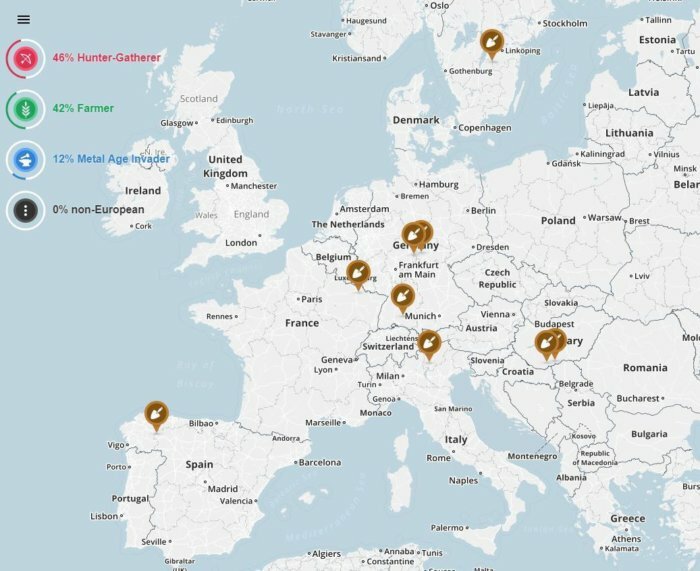 Family Tree DNA notes that most of the world is non-European, saying they “currently do not have enough scientific data” to group them in the same way. This kind of racial bias is widespread across the DNA tests, but companies are working to fix it. Now let’s move to Family Tree DNA’s motherline and fatherline tests. I didn’t take the Maternal Ancestry test on my mtDNA, but I did take the paternal test for my yDNA. And the results were underwhelming. You can also explore matches with other people who share some of your paternal yDNA, and apparently, I only had one match in the entire system. Family Tree DNA is the only test PCWorld reviewed that matches you specifically by paternal or maternal line, so we can’t compare its results here to other services. 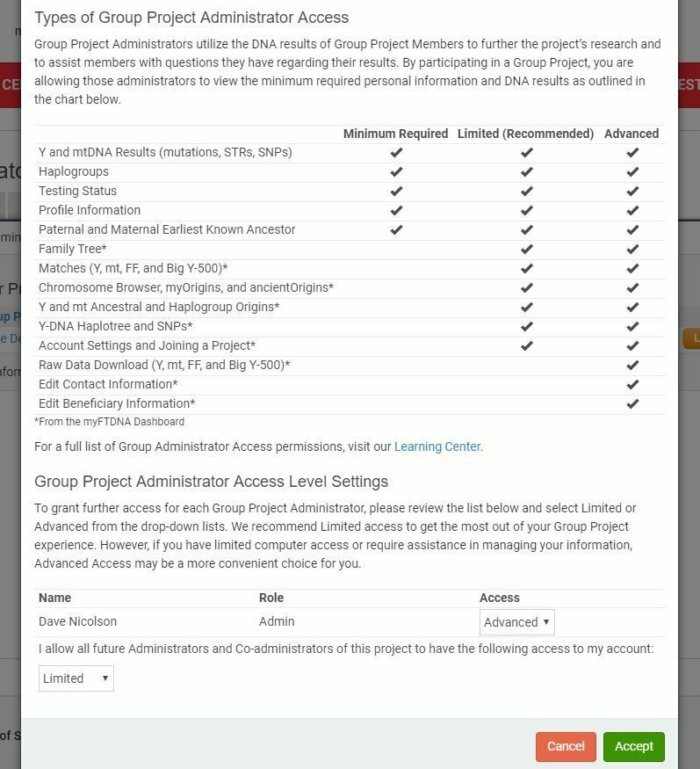 Overall, the entire Y-DNA section was unimpressive and doesn’t seem worth the $169 Family Tree DNA charges. But if you are trying to find relatives on your father’s or mother’s side,you might feel differently. Family Tree DNA’s most redeeming quality is the collaborative way you can contribute to genealogical projects. For example, my surname of “Schmidtmeier” is one of the last names involved in a project tracing lineages originating from the German Principality of Lippe. This was interesting since I’ve never heard about any ties to this obscure region of Germany. Other projects identify specific variants in your DNA that tie you in. All of them have the aim of tracing the lineage of broad swaths of people who share some DNA. 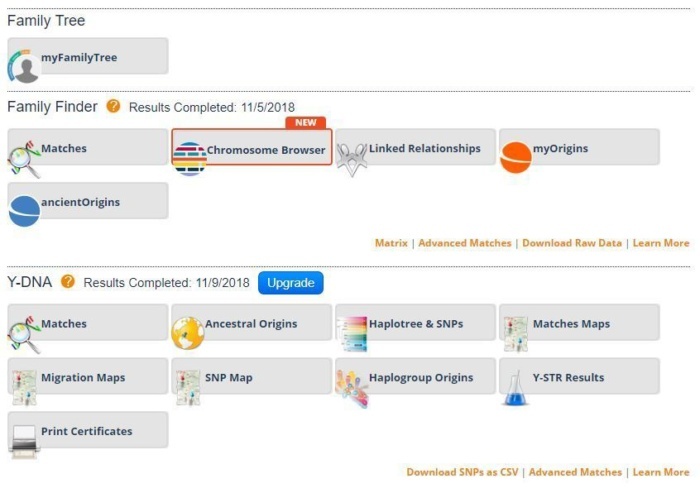 This feature gives Family Tree DNA long-lasting value. Not to mention, you can easily get engrossed for hours in the many projects out there. Maybe you’ll even decide to start your own project? Like just about every other DNA test kit, Family Tree DNA has a DNA matchmaking service that pairs you with people who share your DNA. This can help you find relatives you never knew existed (if they have also taken the test), or you can just gaze in wonder at the thousands of random people whose DNA you share. But the matchmaking system doesn’t let you do that much. You can send a message to someone you matched with, see the surnames each person has listed, and add some personal notes about them if you’d like. And while it does tell you the relationship you have with that person, such as if they are your second cousin or sibling, it doesn’t tell you the percentage of DNA you share, unlike competitors 23andMe and MyHeritage DNA. Good news: My sister took Family Tree DNA’s test, and I’m happy to report it correctly identified us as siblings. Family Tree’s pricing system is our least favorite thing about the service. There are three different tests: Family Finder for $79, Paternal Ancestry for $169, and Maternal Ancestry for $199. Family Tree DNA’s confusing pricing tiers. For example, upgrades to the yDNA test can set you back as little as $69 to as much as $459 for the “advanced test for experts.” Family Tree DNA argues that its test is more low-level than competitors like 23andMe, which just look at mutations to analyze your mtDNA or yDNA. As such, Family Tree DNA can match you with relatives specifically from your mother’s or father’s side. So that is a unique offering you won’t find from competitors, possibly warranting the higher price tag. If you don’t care about learning about the ancient ancestors on your mother’s or father’s side, you can just buy Family Tree DNA’s Family Finder service for $79. It’s essentially the same service you get from AncestryDNA, breaking down your ethnicity on a map and matching you with relatives it identifies in the system. It’s also $20 cheaper than AncestryDNA but $10 more than MyHeritage DNA (our “best bang for your buck” test).